Graveside services for Jim Dear, 60, of Rayville, LA were held at 2:00 PM, Friday, August 17, 2018 at the Lone Cherry Cemetery, Mangham, LA with Rev. Roger Johnson officiating under the direction of Brown-Holley Funeral Home, Rayville, LA. Jim was born February 8, 1958 in Rayville, LA and passed away Wednesday, August 15, 2018 in West Monroe, LA. 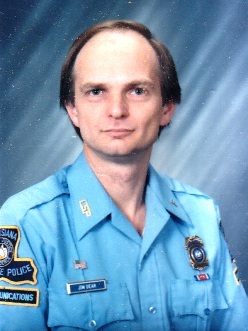 Jim retired from the Louisiana State Police after 35 years as a dispatcher and he worked several years with the Richland Parish Sheriff’s Office. He is preceded in death by his father, Sonny Boy Dear and mother, Juanita Brunson. Survivors include his wife of 33 years, Carolyn Dear of Rayville; daughters, Elizabeth Dear of Rayville and Rebecca Dear of Rayville; grandson, Matthew Johnson of Rayville; brothers, Terry Dear and wife, Tracy of Rayville and Tim Dear and wife, Leslie of Tampa, FL; and 9-nephews and 1-niece. Pallbearers were Justin Dear, Ethan Dear, Brian Stewart, Scott Clack, Jeremy Clack, and Christopher Stewart.